First Greece, now Spain: Can Countries Learn? A key principle of benchmarking is to solve your problems by first studying carefully how others have avoided or solved them. Even as Greece’s crisis is being solved (with North Rhine-Westphalia elections upcoming in Germany, on May 9, Chancellor Merkel is fiercely resisting committing German taxpayers’ money to the rescue, even though it will be forthcoming — on May 10), new ones are emerging — Portugal, perhaps Spain. The size of Spain will make its crisis huge, dwarfing Greece, if it occurs. Many nations, including America, Britain and Spain, face huge fiscal deficits and the need to slash them, while lacking the political will to do so. In Britain, just before a national election, in a television debate, not one of the three political leaders (Cameron, Brown, Clegg) was willing even to hint how they would slash spending and boost taxes. Yet one of them, whoever becomes Prime Minister, will have to do so, and fast. How duplicitous not to reveal what they would do, simply because it will cause pain — mainly, to their political party. South Korea sailed through the 2008–09 financial crisis with remarkable aplomb. Despite its heavy reliance on exports, South Korea registered only a single sequential quarterly decline in real GDP during the global downturn, thus avoiding full-fledged recession. By the third quarter of 2009, South Korean growth had bounced back to nearly 3 percent while unemployment—which even in the worst of the crisis never rose more than a singlepercentage point—had already begun to ease. Indeed, it took barely three quarters for South Korea’s production and consumption to regain pre-crisis levels. Among Asia’s “tiger economies,” South Korea suffered least from the crisis and recovered the most rapidly. Why was the South Korean economy so resilient? Because its businesses and government leaders recognized the opportunity this crisis presented. The familiar rap on South Korea is that its economy is “stuck in the middle,” trapped between an advanced Japan and a rising China. South Korea’s great dilemma—or so it’s often said—is that it falls short of Japan on quality and can’t hope to match China on price. And yet South Korean producers’ performance in the wake of the financial crisis suggests the middle ground may offer advantages. In the post-crisis era, consumers the world over have turned cautious. The new mantra is value for money. South Korean companies are well positioned to capitalize on that new ethos with products that optimize the quality and price tradeoff. South Korean exporters have, in fact, gained market share during the crisis. South Korea’s global market share in phone handsets, for example, rose to 33 percent in the third quarter of 2009, from 22 percent at the end of 2007. In fact, in the US market alone, South Korean mobile phones are currently taking up almost 50 percent of the market share. Its LCD-TV global market share also jumped to 37 percent in 2009, from 27 percent at the end of 2007, and it will soon replace Japan as the world’s number-one LCD-TV supplier. South Korea’s automobile global market share climbed to 9 percent in the third quarter of 2009, from 6.5 percent in the final period of 2007. It is supremely easy to blame the global crisis for a nation’s woes. It is also supremely wrong. Some nations, perhaps only a few, navigated through the turbulence with great wisdom and skill. Most nations stumbled through it and rather than resolve the crisis, simply transformed it from a banking crisis, say, into a sovereign debt crisis (Greece, perhaps UK and Spain). Let the bungling nations carefully study the wise ones and learn. McKinsey Quarterly. South Korea: Finding Its Place on the World Stage. April 2010. 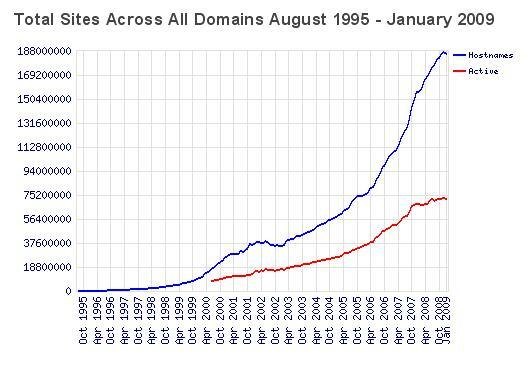 220 million websites… and growing! In a recent interview on the BBC World Service, Yahoo CEO Carol Bartz vigorously defended her company, which is still #2 in the world in search. Yahoo has struggled, after Microsoft tried and failed to acquire it, then reached a collaborative agreement with Yahoo to work together. There are 220 million websites in the world. This is staggering. It means that there is one website for every 30 persons in the world. Since each website contains multiple pages, there are probably far more web pages in the world than there are people. One estimate shows there are 11 billion web pages in existence, over 50 % more than the world population of 6,817,700,000. * They underestimate how crowded the field is — another website? The 220,000,001th website? * They misunderstand how the Web acts to commoditize — enabling people to search for low prices all over the world. * They fail to grasp that the Web is not a service or a product, but an enabler, and what counts is not the enabler but the quality of the service and the experience that is enabled. * They misunderstand that in Web-based business, it is often winner-take-all — people will choose the largest network, coming in second means leaving the game. * Finally, if the proposed website does not meet a real unmet need — and few new websites do — it will fail. Start not with the Web. Start with the need. And think hard about whether the Web is the best enabler. Often it is not. Often traditional localized enablers are best. The Web often is the problem, not the solution. Nils Middleboe: Let Joy Flourish! Today’s Global New York Times has a fine column by Rob Hughes, global soccer columnist, titled “let talent blossom”. The theme is how Spain creates enormously talented soccer players like Messi, Xavi, Iniesta, Fabregas and others. It is not just Barcelona that has a great youth school but other Spanish teams as well. China recently announced it is sending 500 youngsters abroad on a five-year program, mostly to Spain. Why Spain? As European soccer champions, Spain’s results speak for themselves. In an era when there is a global top talent shortage in management, as baby boomers retire, much can be learned about talent development from the realm of world class football. But what? Hughes cites an old, out-of-print book, published in 1970, by Nils Middleboe, a Danish merchant banker and amateur soccer player. The book is “Common Sense about Soccer”. Alas, common sense is often the least common quality. According to Hughes, Middleboe implores coaches not to overload kids with theories, not to spoil their joy, and let their imagination and intuition guide the ball. Middleboe was afraid that the rule-based regimentation, discipline and rigidity of adults, and their insistence on control, would ruin the kids. And indeed, it has, not only in soccer, but in general. Bureaucratization has ruined many creative organizations, as they grow and scale up. The last words in Middleboe’s book implore adults to give kids freedom: “to systematize is to sterilize”. Ever watch Italian football clubs like A.C. Milan? Sterile unimaginative defense. It may work, but it is ruinous for viewing and for talent. It creates unmotivated professionals who play not for the love of the game but for the paycheck, and who usually forget whom they are playing for. And sterilization is precisely what most of our schools do to our kids. There is a fierce dilemma for innovators. To systematize may indeed be to sterilize (the creative process). But — NOT to systematize at all is to RANDOMIZE, and few great things happen randomly. A Las Vegas roulette wheel is not the best paradigm for continual creativity and innovation. This is why many startups fail. They strike it rich one time, but fail to replicate the innovation process with Version 2.0. Here is the innovator’s dilemma, the core dilemma in a series of them: How to systematize creativity, build a creativity machine, without destroying the creative spirit by sterilizing out the spontaneity and openness, and above all, the fun. For kids, soccer is a game. It is fun. As they become professionals, a few retain the spirit of joy and run, like Messi. Most have it sterilized out of them. For innovators, a handful retain the childlike joy of creating. Most lose it. What is your organization’s creativity machine? Is is systematic? Is is sterile? Does it replicate ideas constantly, retaining the fun, the joy, the thrill? Every human being, every business, every organization, needs a systematic creativity machine. But it must not sterilize. Each person, each business must find its own solution to this extraordinarily difficult dilemma. Post-Crisis VC Money: How to Find It? Writing in Business Week’s “small business finance” department this week, Monica Mehta provides some bleak numbers for returns on VC investments — something many of us have suspected for a long while. According to the Boston consulting firm Cambridge Associates, $100 invested in a VC fund in the year 2000 is worth today a bit more than — $98, a rate of return of minus 2 per cent. Total VC fundraising dived in 2009, to a miniscule $13.7 b., in the U.S., down two thirds from pre-crisis 2007. What can be done by startup hopefuls seeking to raise VC funding? She cites a case study on HitFix, an LA-based entertainment news website. The two founders discovered that mid-sized VC funds have greatly diminished, leaving many small laser-focused funds that specialize, on one end, and huge blue-chip funds like Sand Hill Road at the other. They managed to raise a $980,000 seed round right after Lehman Brothers collapsed, then imposed drastic cost cutting and with minimum funds reached 500,000 users of their website. Later, they turned to an angel network, Golden Seeds, for Series A funding. After lining up an anchor investor, smaller VC funds were more willing to invest. They found that investors require HitFix to reach profitability with Series A funding alone. Treat Series A as if it were your last, they found. There will be no quick IPO, HitFix discovered. Experts coach them to look instead for a strategic sale. I urge all startup hopefuls to reconsider and rethink their business model. Instead, try to bootstrap. Invent a product or service that will generate quick cash flow. It could even be a day job. Use your evenings to write code or build a prototype. It will take much longer — but you will retain control, and will not face VC’s who give you wrongheaded orders, and as Directors insist you carry them out. Do you have highly creative, supercreative, people in your organization? Are they perhaps hidden, undiscovered? Here is a way to discover them. (Faithful blog reader Yoav Medan supplied this example, from marshmallowchallenge.com). The author of the exercise is Tom Wujec, a Fellow at Autodesk. If you need to kickstart a meeting, get a team into a creative frame of mind, or simply want to encourage your organization to think about what it takes to dramatically increase innovation, invest 45 minutes to run a marshmallow challenge. I suggest altering the exercise slightly. Why tallest? Why not, “most beautiful”? “strongest”? Or just — without any “most”, just build it! Put the winning model on display in the lobby, with names of the team members. When you run the marshmallow challenge, provide loud music in the background, and an atmosphere of fun, laughter and excitement. Allow spectators. Get the CEO to participate. Wall Street was stunned as civil-fraud charges were brought against GOLDMAN SACHS. The Securities and Exchange Commission alleges that thebank deceived investors in a synthetic collateralised-debt obligation built on mortgage assets, by not disclosing that Paulson, a hedge fund that had some say in choosing which securities went into the product, would profit if the CDO performed poorly. Goldman vigorously denied the allegations. Synthetic collateralized debt obligation? How many people know what that is? How many finance professionals understand what it is? There is a key point here, beneath the allegations of corrupt behavior. Simplicity is a core principle, in strategy, business design, in finance, in life. Complexity can only be justified, if it exists within organizations in order to simplify life for clients and customers. For instance, IBM complicates its organizational structure, using a matrix structure and a customer-facing executive, who puts together a complex virtual organization, with the sole purpose of simplifying life for the client. Allegedly, Goldman Sachs used the complexity of CDO’s (collateralized debt obligations) to obscure the fact that the “collateral” was not real — the sub-prime mortgages that comprised the collateral were worthless. They sold UDO’s uncollateralized debt obligations, allegedly, worth about as much as UFO’s (unidentified flying objects, or aliens). Very few people sat down and read the legal documents, that showed what “collateral” really underpinned the security. (One who did was the doctor with Asperger’s Disease, whose illness enabled him to carefully read the fine print, and profit vastly from it by selling them short!). Complexity, when it serves clients by making their own lives simpler, is wonderful. Complexity, when it hides alleged nefarious manipulations, is contemptible. In the end, it is caveat emptor. Buyer, beware! If you don’t understand it fully, and if they can’t explain it to you — run as far and as fast as you can. Why didn’t Goldman Sachs’ clients do this? MIT Media Lab founder Prof. Nicholas Negroponte’s One Laptop Per Child vision has been out of the news for some time. Its goal is to “equip each of the two billion children in the developing world with a computer.” The computer, specially designed, uses solar power, has an LED screen visible in sunlight, has wireless, and as Negroponte says, “may be the main source of light in the villages where it is used, in the evenings”. According to the Global New York Times, April 19, 2010, the project has failed and it has succeeded, simultaneously. Failed, because only about 1.6 m. laptops have been distributed so far, according to OLPC Foundation’s Matt Keller. The biggest numbers are in Uruguay (400,000), Peru (280,000), Rwanda (110,000) and Haita and Mongolia, 15,000 each. This is about two orders of magnitude below the project’s sweeping goal. Succeeded, because the idea has caught on. Microsoft has found ways to help children in the developing world make better uses of existing PC’s. MS software adds multiple cursors on a screen, each controlled by a separate mouse, for example. The product is called Multipoint and was well received. India has indicated it wants to build its own “$100 laptop”. OLPC has lit a spark that created many innovations. Some nations, like India, preferred to do their own OLPC design and production. This is legitimate. Sometimes, world-changing entrepreneurs like Negroponte need to be satisfied with the fact that the ‘ball’ they toss into the air will be caught by others, who will run with it much faster and better. This, in my view, is success! Keller says the new OLPC laptops will have a hand crank; one minute of cranking will yield 10 minutes of use. Say — can I get one of those? Nations as Brands: America Improves! The BBC World Service regularly conducts polls about how people around the world perceive nations, asking whether Country X’s influence is mostly positive or negative. * Negative ratings of the U.S. dropped by a huge 9 points during the past year. The US is viewed positively, on balance, in 20 or 28 countries, with 46% saying it has a positive influence, while 34 % say its influence is negative. Much of this change can probably be attributed to the departure of George Bush and Presidency of Barack Obama. * Germany is most favorably viewed, with a 59% positive rating, followed by Japan 53%, UK 52%, Canada 51% and France 29%. The EU is viewed positively by 53%. * Iran is the least favorably viewed nation (15% positive), followed by Pakistan (16%), North Korea (17%), Israel (19%) and Russia (30%). * The US has now overtaken China in terms of positive perceptions. * Mexico has low ratings, perhaps owing to the drug-related violence. * People in China and Russia have changed their views on Iran; far more see Iran in a negative light, far fewer, in a positive light. Perceptions of nations have a direct measurable influence on countries’ trade and foreign investment. Israel’s negative perception has held true for years; its leaders do not seem overly concerned. Unless this image problem is dealt with head on, it will soon find expression in Israel’s economic wellbeing. Strategy guru Gary Hamel has for years preached that innovating business designs can be a far more powerful source of competitive advantage than mere product innovation. I have echoed this. But it emerges that it is far harder to change a company’s business design — the way it prices, markets, produces, sells, finances, and organizes its supply chain — than to change its products. Today’s Global New York Times has a good example of how pricing policy can be a key source of innovation. Kevin O’Brien reports that when TeliaSonera, the Nordic telecom, turned on the world’s fastest network last December, based on a technology known as LTE Long Term Evolution (successor to 3G and WiFi, and WiMAX), customers increased their consumption of data flow by ten times. Conclusion: The days of “all you can eat”, or flat-rate pricing by telecoms, are over. To keep mobile profitable in the long run, telecoms and mobile operators are considering, like TeliaSonera, new pricing plans with download limits, based on actual consumption. TeliaSonera thought hard about pricing even before introducing its LTE technology. It is interesting that there is an ‘eskimo’ phenomenon here. After one telecom revolutionizes its pricing, it may be that many others will follow quickly — as Paul Samuelson once said about how economists follow the herd: When one Eskimo (economist) in a row turns, so do all of them. What are the implications of the new pricing policy? Are there opportunities here? How will it affect consumers? How should consumers respond? Innovators should ask: Can competitive advantage be gained by changing and innovating pricing policy in my industry? How? When? Will others follow? Paying or what you get is the new mantra for mobile operators, by Kevin O’Brien, April 19, p. 16. How many of us read the newspaper daily, and cluck our tongues at the continual stream of bad news, crises, disaster, looming disaster and violence? Why do we buy in to the untested and I believe wrong assumption of editors and publishers, that bad news sells more papers and gets more eyeballs than good? [A friend of mine, a journalist, wanted to write up a charity project I run, but said his editor said no, he wanted scandal, not do-gooders!]. Here is a suggestion for a brain exercise, that can transform bad news into good. We cannot change the editorial policy of the Herald Tribune, New York Times or Wall Street Journal. But we can change the way we USE the news. 1. Read, say, the Financial Times. Find the bad news stories. 2. For each, think about how they can be transformed from a bad-news crisis story into a good-news business opportunity. 3. Make this a permanent HABIT. Do it daily. You will be surprised at how many fine change-the-world ideas emerge from a constant stream of negative articles. * “Only rebalancing will revive Britain’s precarious economy” (Martin Wolf). Britons are in hock, and have overspent; they can’t resume spending, but unless they do, the British economy will remain weak. Opportunity: A consulting service for individual families that does ‘turnaround’ plans for them, consolidates their debt, and makes them financially sound, something many families cannot do for themselves. It could be government-sponsored. Good result: Financially healthy families may feel more optimistic, better organized to resume spending. * “IMF to weigh bank surcharges”. IMF wants banks to increase their capital. Opportunity: Money is going to get scarce. Banks will lend less. They are already leery about lending. Start a service helping CFO’s stretch their cash, and find unique creative ways to get working capital. * “IAE says oil demand will rise to record levels in 2010”. Opportunity: anything and everything that can conserve fuel, electricity, energy, or create new forms. * “Twitter starts ads”. Opportunity: How can you leverage Twitter for clever creative advertising? * “Mongolia rail push”. Mongolia’s government wants to build 5,000 km. of rail lines. Opportunity: If you have any knowledge about railroads and related services: here’s your chance. For more about this brain exercise, please read our forthcoming book Global Risk/Global Opportunity (Maital and Seshadri), SAGE India June 2010.